about Birthdays around the World. It requires students to read for information. 1. 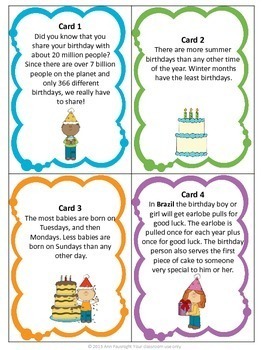 Print the Birthdays around the World Scavenger Hunt cards on card stock and cut them apart along the dotted lines. 2. 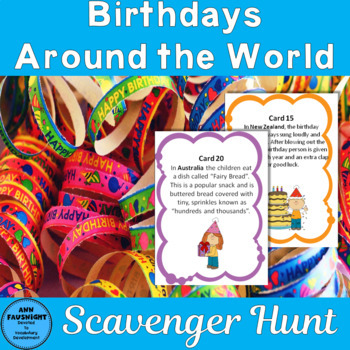 Make copies of the Birthdays around the World Scavenger Hunt questions worksheet (2-sided). Each student needs a copy. 3. 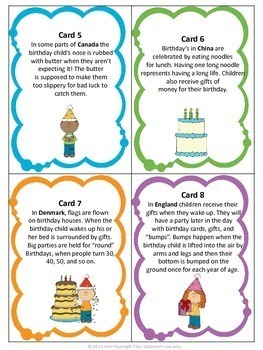 Place the Birthdays around the World Scavenger Hunt cards around your classroom where students will be able to find them. You can put them on chairs, on the computer keyboard, on the back of your classroom door, on the sides of student desks, on the chalkboard, or wherever you like. 4. Students have to search the room and find all of the sentence cards to answer the questions. You can differentiate by having students work alone or with a classmate. Find more Scavenger Hunts here. When you buy 5 scavenger hunts you may choose one of the following for FREE! Just leave your username and an email address under the "Ask a Question" tab.